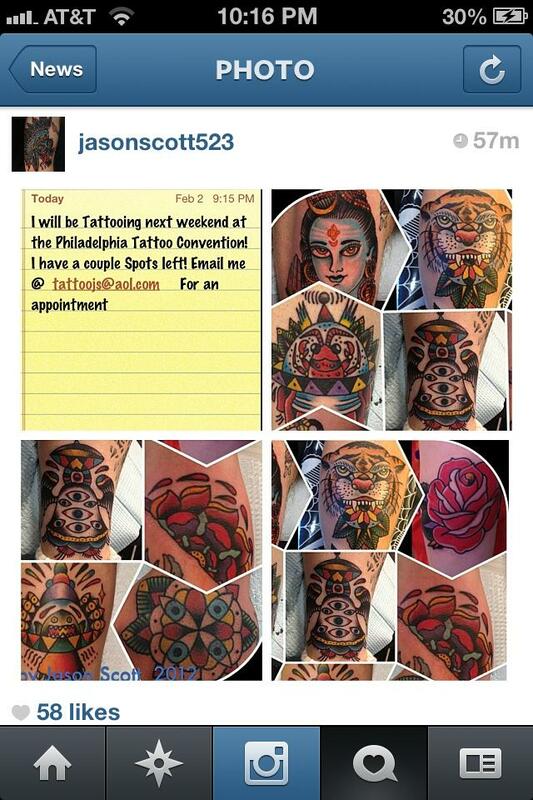 The Philadelphia Tattoo Arts Convention 2013 is upon us- This coming Friday, Saturday and Sunday at the Philadelphia Convention Center, some 800 tattooers will be working in one space. Sounds crazy? It is. But there are a bunch of really fine artists working the show that are worth stopping and checking out. Even if you don’t plan to get tattooed or they’re all booked up, I’m sure their booths will have offerings that will be hard to pass up. Paintings, Prints, Tshirts and Flash… there’s always something that’s within budget. One of those tattooers is a fella that I’ve known for closing in on 20 years, but I’ve yet to get tattooed by. As open skin is quickly disappearing, I’m going to try to work on that soon- Jason Scott. I knew him from my Florida days, but he’s since moved up north to New England, operating out of New Hampshire. Live free or die, indeed. I’ve seen the shirts he’s going to be selling at this year’s convention… if you’re an old skater.. you’ll dig them. The sheer amount of tattooers at the Philly show is overwhelming, but… like I said- some of these folks are absolutely worth tracking down.